Mainland China continues to reject any proposal for reunification outside the “one country, two systems” framework. The Taiwanese referred to them as the “Seven Dwarfs.” The group, led by a former defense minister, an ex-secretary-general of the National Security Council and a former chairman of the main opposition party, proposed a new “Greater One China” framework last week that, though not uncontroversial on the island, should have appealed to Beijing. And yet, within 24 hours China had shot it down, a reminder that in the Taiwan Strait, negotiations on Taiwan’s future status are more process than substance — and may be entirely futile. At first glance, it looked like the effort would have some traction in Beijing as well as among those in Taiwan who favor ever-closer ties with China. After all, its chief architects included Su Chi, a former head of the National Security Council and a close confidant to President Ma Ying-jeou (who enjoys cordial ties with Beijing), as well as Hau Pei-tsun, a Kuomintang (KMT) stalwart, former premier and defense minister who has often sounded impatient about the “reunification” of Taiwan with China. Also in the group was Shih Ming-teh, a former chairman of the opposition Democratic Progressive Party (DPP) whose penchant for publicity compelled him to lead the Red Shirt Movement in 2006, which sought to unseat then-president Chen Shui-bian of the DPP for corruption. Completing the line-up were Hung Chi-chang and Chiao Jen-ho, former Straits Exchange Foundation chairman and vice chairman respectively; former Mainland Affairs Council chairman Chen Ming-tong; former minister of foreign affairs Chen Chien-jen, and Andy Chang, head of Tamkang University’s Graduate Institute of China Studies (astute readers will have realized that there were in fact eight dwarfs; Hau decided to pull out at the last minute, stating sensitivities arising from his being the father of Hau Lung-bin, the Taipei Mayor and a possible contender for the presidency in 2016). The bipartisan group proposed an alternative — admittedly a transitional one — to Beijing’s narrow “one China” framework, based on five principles. 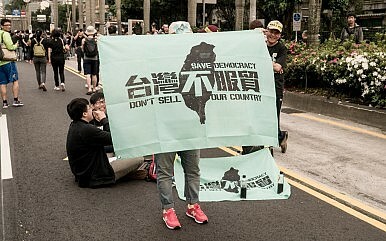 Among them was the creation of a “limited international legal entity” to handle cross-strait affairs and under which both sides — the Republic of China (ROC) and the People’s Republic of China (PRC) — would enjoy equal rights to participate in international organizations and establish normal relations with other countries. Both sides would also commit to “respect” rather than seek unilateral changes to the current status quo (in other words, no unification and no independence). Furthermore, the two sides would end hostilities, renounce the use of force against each other, and would not sign any defense treaties with other countries that are unfavorable to the other side. Needless to say, the term “greater one China,” an expansion of the “one China” principle, received a cool reception among those in Taiwan who favor independence, and despite claims by Shih and his spouse, the majority of Taiwan’s youth did not support the framework. But the effort was creative and sought to generate more space for the ROC than is possible under Beijing’s “one China.” Furthermore, as previously mentioned, its masterminds had a long history of close relations with Beijing. It should therefore have had legs in Beijing. And yet, the next day, Taiwan Affairs Office spokesman Ma Xiaoguang blew it out of the sky by arguing that relations across the Taiwan Strait were not “state-to-state” and should be conducted under the so-called “1992 consensus.” Others viewed the proposal as little more than collusion between the DPP and pro-independence forces within the KMT, an extraordinary claim given the composition of the group. So the much-publicized effort, which raised considerable alarm within the “green” or “pro-independence” community in Taiwan, was stillborn. Given this outcome, we can reasonably ask: If elements on Taiwan who are on friendly terms with Beijing and who have a proven track record of opposing de jure independence cannot even get a seat at the negotiation table with their Chinese counterparts, who can? By dispensing so quickly with the “greater one China” framework, Beijing made it clear that it does not desire negotiations to chart a course for Taiwan’s future that is agreeable to Taiwan’s 23 million people. The best — and only — offer made by China remains the “one county, two systems” framework, a formula that is failing in Hong Kong and that has much lower chances of success in Taiwan. In fact, even the majority of KMT voters reject “one country, two systems” as insufficient, not to mention the other half of the population that votes for the DPP. Su, Shih, Hau and others sought to propose something that might have had more appeal among the Taiwanese population, but Beijing was adamant that this was going too far and that it would not agree to anything that even remotely acknowledged the existence of the ROC as a sovereign entity. Based on this, we can only conclude that there is no such thing as negotiations across the Taiwan Strait regarding Taiwan’s future; Beijing dictates, and that is the extent of it. Everything else, including the many meetings held between academics from both sides in China, Taiwan, and Japan, are presumably exercises in futility, even if the participants themselves are well meaning (in his book Uncharted Strait, Richard Bush of the Brookings Institution observes the inability of academics and negotiators from both sides to agree on anything, which sometimes is limited to “wordplay”). Beijing’s intransigence notwithstanding, both the DPP and the KMT should continue to explore various scenarios by which to improve ties with China, if only to demonstrate to the international community that the principal source of tensions in the Taiwan Strait isn’t Taiwan, or even Taiwanese independence, but Beijing’s unwillingness to explore alternatives to “one China.” As such, the DPP should once and for all formulate a clear China policy (its failure to do so ahead of the 2012 presidential election cost it dearly) and make an offer to China. While doing so would likely alienate a segment of its “deep green” constituents, such an effort would win it crucial points in Washington, D.C., while comporting little risk, as Beijing would presumably turn it down. And yet, by proposing a framework other than independence — a federalist system such as that in the E.U. or Canada comes to mind — the DPP would show goodwill and, even more importantly, would put the ball in China’s court. By thinking creatively and making an offer, it would be much more difficult for Beijing and the U.S. to portray the DPP as the principal impediment to peace, a handicap that has had a tangible impact on the party’s ability to garner support among allies, and which at times compelled people in the White House to meddle in Taiwan’s democratic system to ensure a KMT win. Through creativity and by working with other groups within their society, Taiwanese could demonstrate to the world that they aren’t the troublemakers who are preventing the resolution of one of the world’s longstanding conflicts — China is. How Do You Solve a Problem Like Taiwan? Beijing must understand the roots of discontent in Taiwan if it wants to truly achieve unification.